JAPAN: Sony launches 25in OLED screen, but for pro use only | What Hi-Fi? But before we all get too excited about the future of TV having arrived, a couple of facts about the TriMaster EL BVM-250: it's aimed at the broadcast and professional TV production industry, and will sell for Y2.4m. The new screen, which will be joined in July by a 17in model (at Y1.3m/about £10,500) delivers 1,000,000:1 contrast ratio, and is said to have an extremely wide colour gamut, excellent response and greatly reduced image lag when compared to conventional LCD monitors. Those at the launch at Sony's Tokyo HQ were treated to side-by-side demonstrations of the new screens and Sony's existing LCD monitors, and report richer colours and true blacks, especially noticeable when the screens were on, but not showing an image. 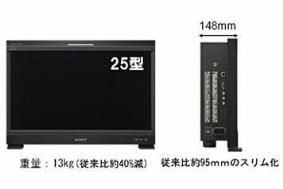 Aimed at use in editing suites, broadcast control rooms and mobile satellite trucks – of which Japanese broadcaster NHK, for example, has an impressive fleet – the screens actually only cost about 10% more than Sony's equivalent LCD reference monitors. However, that level of pricing suggests affordable OLED TVs in larger sizes are still a long way off, and Sony made no announcement of any plans to extend the technology into the consumer arena.